Hundreds of people walk past this palm tree every day without spotting its secret. 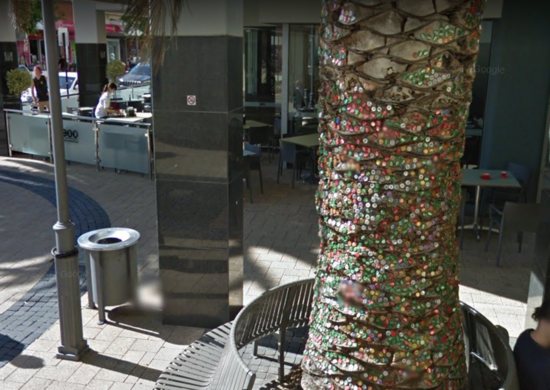 The first time you walk past the bottle cap tree on Perth’s King Street you probably won’t notice it. 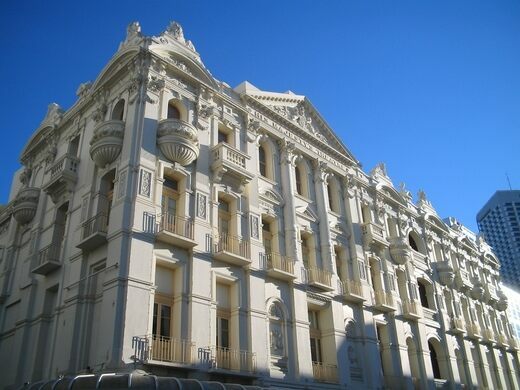 After all, there’s the impressive architecture of His Majesty’s Theatre on one side of you, and a huge, bright street art mural on the other. With both of those vying for your attention, why would you notice the sidewalk palm tree you’re wandering past? But next time, have a look—the trunk is studded with hundreds of colorful bottle caps. Exactly how this odd bit of decorating happened, or even when it happened, no one is quite sure. Local legend has it that the bottle art started when a bike courier mindlessly stuck a cap into the tree one day, and others started to follow suit. Nor does anyone know quite how the tree feels about its quirky jewelry, but for now, the bejeweled tree appears healthy enough. The tree is the first in a row of three palm trees on the sidewalk along King Street, at the corner of Hay Street, across from His Majesty's Theater. Visible from both land and sea. A monument to a working class martyr. The ruins of a once prosperous power station have become a mouldering seaside gem. Locals place their offerings on this nightmarish gnarled tree so the witches won't summon another storm. Legend says this fabled well held part of a mythical Norse tree.